The long story is a little convoluted and I need to vent and share all the details, so bear with me here. The short story is that we missed our connection to Chile, and we are now in a hotel in Toronto waiting to take a flight to Santiago tomorrow. Here's what was supposed to happen: we should have flown from Philly to Toronto, taking off at 8:11pm and landing at 9:35pm. We have an hour of layover - kind of tight, I know! - and then we catch at 10:35pm flight from Toronto to Santiago. Here's what actually happened: We arrive at the airport in Philly, and find out that Air Canada doesn't have any staff there, they just code-share with United. As a result, the United person could only print our boarding pass for the first leg, and told us to get the next boarding pass in Toronto (and we had tried online before, same problem). The flight out of Philly was delayed, because of problems earlier in the day. Our plane came in around 8:10, and after waiting in line on the runway, I think we got in the air around 8:50. The flight time is supposed to be 1 hour in the air, so we are already going to cut it very close. Then the real problems began. We land in Toronto around 10:00pm, giving us approximately 35 minutes to taxi to the gate and then make the connection. Tight, but do-able. We get to the gate, and after a while of standing in the aisle, we get an announcement that they can't operate the jet bridge, so we can't exit the plane. The clock is ticking, and around 10:20 they get the jet bridge attached. Very tight, but maybe possible! But wait, there's more! For some crazy reason, they still can't let us off the plane, because apparently there is no gate employee to open the doors from the jet bridge into the airport for us. Seems to me like they could have seen this need about...35 minutes ago. While we are standing in line, the clock hits 10:35pm and we think all hope is lost...but then a nice guy next to us tells us he checked our flight to Chile and that flight is delayed until 11:00pm. Hope springs again! We run off the plane at around 10:40, passing people on the moving walkways to be the first one in the line for Passport Control. We get there with time to spare and things are looking good. But then, we find out that the Customs Agent cannot let us through, because we DON'T HAVE OUR BOARDING PASSES, which Air Canada declined to give us in the first place!!! We had to exit out of security, and by the time we reached an Air Canada agent, the Santiago flight was in the air, and all they could do was put us in a hotel for the night. However, a few good things happened along the way. 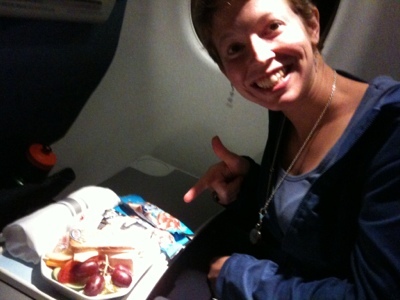 For reasons we don't quite understand, we got upgraded to first class for the 1 hour flight to Toronto, so we enjoyed a nice snack/meal of cheese and crackers, plus comfy seats. We also had a super friendly flight attendant. We found someone else's Kindle left behind in the seat pocket, so we helped her figure out the owners name so it can be returned properly. And now, we are going to sleep in a cozy bed, and hoping that everything goes a little smoother tomorrow (and hoping that Air Canada will upgrade us on the 10.5 hour flight tomorrow to make us feel better). Gotta love how airlines/airports work! Sounds like you guys are in good spirits though, hopefully well rested and finally on your way to your actual destination. Safe travels! I look forward to following the blog. The first class upgrade made it a lot easier to maintain good spirits through all of this frustration. Hopefully we'll be posting from Chile soon! Haha!! Fiona and I were once stranded in Toronto by Air Canada! Actually Air Canada Jazz, but close enough!! We recommend you take the buses downtown, visit the shopping center for some moose-centered paraphernalia, get drunk at the Steamwhistle Brewery (or at least watch the train table operate) because you suddenly decide you are the type of person who asks for things and you keep _asking_ for more samples, then despite the platonic nature of the trip refer to it as your "lesbian vacation to Toronto" for perpetuity. Also. its important to get chatted up in the restroom by people who are attending the religious revival occurring at the complementary hotel.